Scarlett Reverie: Tonner Scarlett: Blue Portrait Gown "Mrs. Butler poses"
Tonner Scarlett: Blue Portrait Gown "Mrs. Butler poses"
Franklin Mint's blue portrait gown is always stunning. I am not aware of the kind of velvet they use for this gown but it has an amazing reflect that creates drama and befitting of a gown we never see but is forever ingrained in our memory as one of the most beautiful dresses that Scarlett wears. 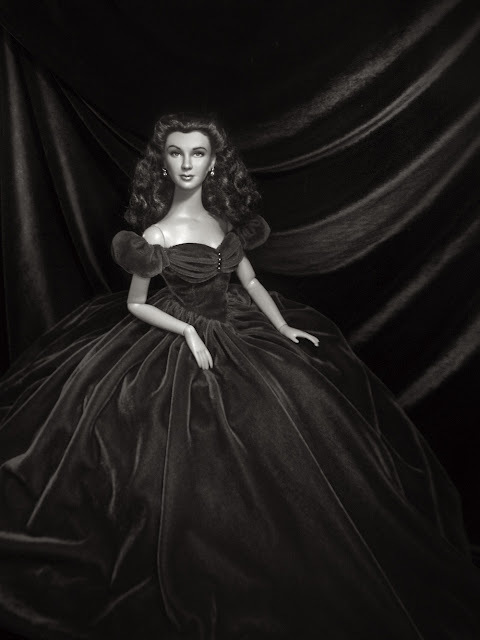 I did this in desaturated color and in black and white to see if the gown still has that impact and I believe it maintains its glorious fill of a picture. When asked by friends why I go through all the trouble of photographing dolls, I always say: You know there are things that you really love that you want immortalized and photographing them is one way of making the doll be "more than just a doll". What good is articulation if the doll is not posed -- and posed maximizing the possibilities of expression. What good is a doll kept in a box? It's like having a playground and not being able to play in it. Dolls were always meant to capture imagination. A child given that dreamland grows to see what his or her mind can explore. It gives you silent joy and an amazing play to spend your time. My only wish is to have better ways of photographing them: backdrops, sculptures, more gowns and a stronger eyesight to repaint -- not mention stronger patience in repainting. The weekend is coming. Next week I am awaiting a new ensemble for Scarlett -- none GWTW but one that I've always eyed for a long time. As they say, the Universe listens to the most ardent wishes of the soul. So, I hope it arrives. After that traumatic Tonner Blue Portrait gown getting lost, I can only cross my fingers that hard-earned money is not lost as well as the chance to imagine, play and photograph. Have a splendid playful weekend everyone! Oh sure! Do you have an email I can send them to you?